A renowned teacher and writer of the acclaimed The Spirit of the Disciplines, Dallas Willard, one of today's most brilliant Christian thinkers now offers a timely and challenging call back to the true meaning of Christian discipleship. In The Divine Conspiracy, Willard gracefully weaves biblical teaching, popular culture, science, scholarship, and spiritual practice into a tour de force that shows the necessity of profound changes in how we view our lives and faith. In an era when many Christians consider Jesus a beloved but remote savior, Willard argues compellingly for the relevance of God to every aspect of our existence. Masterfully capturing the central insights of Christ's teachings in a fresh way for today's seekers, he helps us to explore a revolutionary way to experience God--by knowing Him as an essential part of the here and now, rather than only as a part of the hereafter. "The most telling thing about the contemporary Christian," Willard writes, "is that he or she has no compelling sense that understanding of and conformity with the clear teachings of Christ is of any vital importance to (their) life, and certainly not that it is in any way essential . . . Such obedience is regarded as just out of the question or impossible." Christians, he says, for the most part consider the primary function of Christianity to be admittance to heaven. But, as Willard clearly shows, a faith that guarantees a satisfactory afterlife, yet has absolutely no impact on life in the here and now, is nothing more than "consumer Christianity" and "bumper-sticker faith." Willard refutes this "fire escape" mentality by exploring the true nature of the teachings of Jesus, who intended that His followers become His disciples, and taught that we have access now to the life we are only too eager to relegate to the hereafter. The author calls us into a more authentic faith and offers a practical plan by which we can become Christ-like. He challenges us to step aside from the politics and pieties of contemporary Christian practice and inspires us to reject the all too common lukewarm faith of our times by embracing the true meaning of Christian discipleship. 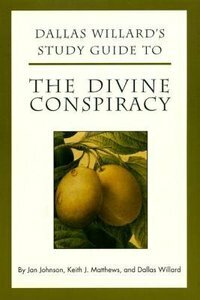 About "The Divine Conspiracy (Study Guide)"
In his bestselling "The Divine Conspiracy", Willard mapped out a transformational path for Christians to experience and know God as part of the here and now. Now this reader's guide provides a series of brief essays that expand on the discussion begun in the original book. Dallas Willard (Ph.D., University of Wisconsin) is a Professor in the School of Philosophy at the University of Southern California in Los Angeles. He has taught at USC since 1965, where he was Director of the School of Philosophy from 1982-1985. His philosophical publications are mainly in the areas of epistemology, the philosophy of mind and of logic, and on the philosophy of Edmund Husserl, including extensive translations of Husserl's early writings from German into English. He also lectures and writes award winning books on Christian Spirituality. His book Renovation of the Heart received Christianity Today's 2003 Book Award in the category of Spirituality. The Divine Conspiracy was selected Christianity Today's "Book of the Year" for 1999. His other publications include The Spirit of the Disciplines; Hearing God; The Great Omission; Renovation of the Heart in Daily Practice and most recently Knowing Christ Today: Why We Can Trust Spiritual Knowledge and Personal Religion, Public Reality?.